Release Date: March 3rd, 2006 (Paris Theater and Angelika Film Center) by Sony Pictures Classics. The Cast: Diane Krüger, Benno Fürmann, Guillaume Canet, Gary Lewis, Danny Boon, Daniel Brühl, Alex Ferns, Steven Robertson, Lucas Belvaux. In French, German and Latin with subtitles. BASIC PREMISE: During World War I, French, Scottish, and German troops decide to have a cease fire on Christmas Eve. Based on true events. ENTERTAINMENT VALUE: Just when you thought that every war story has already been told through film by now, Joyeux Noel comes along. What makes this a powerful film is that it’s much more drama and romance than you would expect from a typical war film. Before the war, a priest (Lewis) tries to convince two men not to go for military training. Then there’s Nikolaus (Fürmann), an opera singer who learns during a show that he must join the war and part from his lover Anna, played by the beautiful Diane Krüger. At this point, the war is on as the plot moves to the battlefields. Writer/director Christian Carion brilliantly shows the war from the sides of the German, French and Scottish so that neither come across as the most important or most likable of them all. 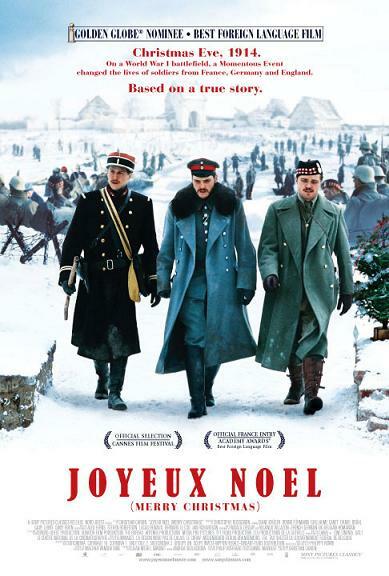 Once the three officers call a temporary cease fire, Joyeux Noel becomes refreshing and even romantic, i.e. when Anna comes back to reunite with Nikolaus. Watching the three different troops singing and drinking together seems quite funny, shocking and ironic at first, especially given that they are all out there to serve their country. The cinematography is quite impressive—some of the intense action sequences feel like scenes from Saving Private Ryan , although they’re brief. Even during the musical numbers, Joyeux Noel succeeds to be enchanting and engaging without seeming the least bit awkward. SPIRITUAL VALUE: Had it not been for Christmas Eve, perhaps the troops would have continued fighting eachother. But like in many war films, the troops and even the officers all wonder the same question: why are we here on the battlefields risking our lives? Joyeux Noel ultimately celebrates the importance of friendship, love and, above all, humanity. Even during the time of war, these powerful, ironclad virtues can still warm our hearts—and soften them as well. IN A NUTSHELL: A surprisingly warm, uplifting and enchanting war story!